Vril Adolf Hitler: [Riding in on a T-Rex] Sieg Heil, Mutterfickers! 7 years and 20 million budget wasted on a pile of garbage. To be fair, the first few minutes seem quite compelling. However, the film takes a huge nose dive soon after. Nothing makes any sense especially in relation to the first film. It is a complete non sequitur. 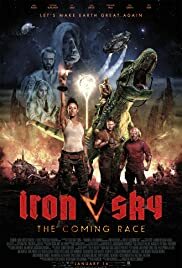 The saving grace of the first film, Iron Sky , the visual effects work. The plot was thin and the story was ropy but the design of the space crafts and space battles scenes gave it a stylish look that could have been built upon with the sequel. 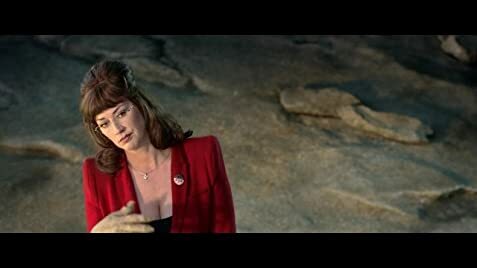 Instead in terms of the VFX work nothing really connects the first film with the sequel and the style is lost. The director has thrown away the best parts of the first film and subsequently has no real platform to build upon. The result is a shambling mess. It is hard to even find the will to spend time to describe how terrible it was. The trailers for other films were the best part of the showing. You should leave after those and then spend the next 90 minutes scraping your face with a cheese grater because that would be a more enjoyable thing to do than endure the torture of what Timo Vuorensola has to serve up to you. I can't believe he has a career after this complete waste of time and money.